Looking for a superior Hi-Fi USB cable? Signature USB interconnect, using Tuned ARAY techniques, results in a significant improvement in the digital signal transmission. Chord Signature USB Tuned ARAY Cable is based on the tech and R&D developed from Chord's flagship Sarum range, resulting in highly coherent musicality, unique to the Tuned ARAY technology. The Signature Tuned ARAY USB cable is a perfect example of Tuned ARAY technology. Your choice of USB cable is highly critical, especially true if you are listening to high-resolution FLAC, WAV music (actually even MP3 gains a sense of rightness). Signature Tuned ARAY will allow you to get properly involved with the music you play. What is more, is that Tuned ARAY cables make it possible to extend listening sessions, and consequently, audiophiles who use Tuned ARAY cables tend to stay up later than they meant to. The technology that the Signature Tuned ARAY interconnect is based on, is the geometrical techniques that Chord developed for the Sarum range of cables. The silver-plated signal conductors are insulated using PTFE. The cable shielding is provided by a high-density double braid that works perfectly as protection for very high frequencies. A further addition of a shielded cable is used to carry the voltage, and therefore all the cables within the black outer braiding are separately shielded. 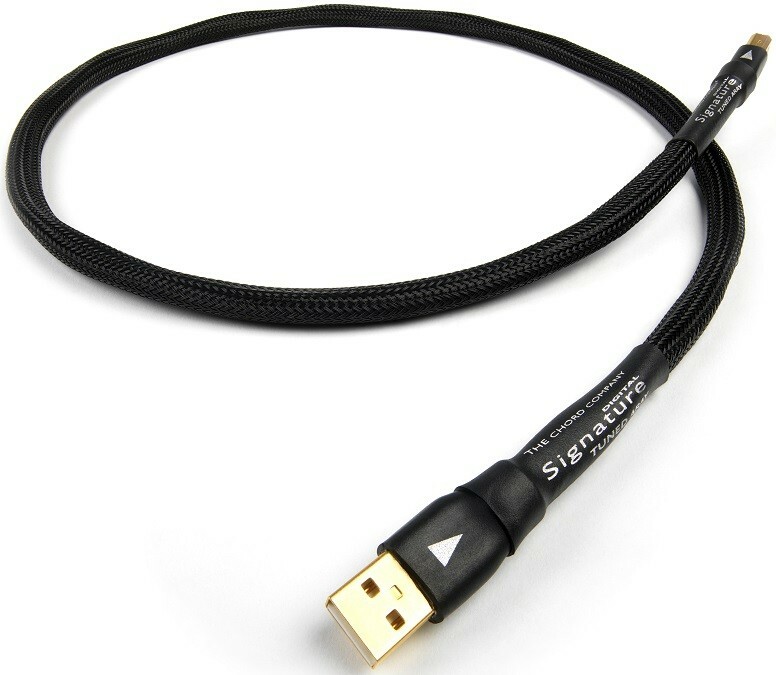 Similarly to the Sarum Tuned ARAY USB cable, the Signature USB cable is crafted almost entirely by hand, with a precise stripping machine employed for the cable ends. With all Tuned ARAY cables terminating the cables requires a very high degree of accuracy. Quality USB plugs are hard to find. The desired performance level was achieved by altering and gold-plating the connectors with two microns of 24kt gold. To avoid any unwanted compression of the conductors, which is profoundly important in the performance of digital cables, Chord utilise external strain relief and reinforcement. Tuned ARAY research has meant that Chord are able to produce remarkably transparent interconnects. It is known that the choice of digital cable is as important as analogue interconnects or speaker cables, and consequently Chord developed their Tuned ARAY technology for digital cables. The benefits of Tuned ARAY can be heard in pretty much any system they are used in. If your system set-up utilises a USB connection, then the Signature Tuned ARAY is well worth listening to. The Sarum tuned ARAY is as intricate as the rest of the TUNED ARAY range. Inspired by clear music from a Macbook. If this is how you’ll be storing your music, then the Sarum is for you.